My cats have always loved the patio. It's the perfect place to sit and think, or stretch out in the sun and show your tummy. In the case of Tiger the tortoiseshell, that tummy is rather large! 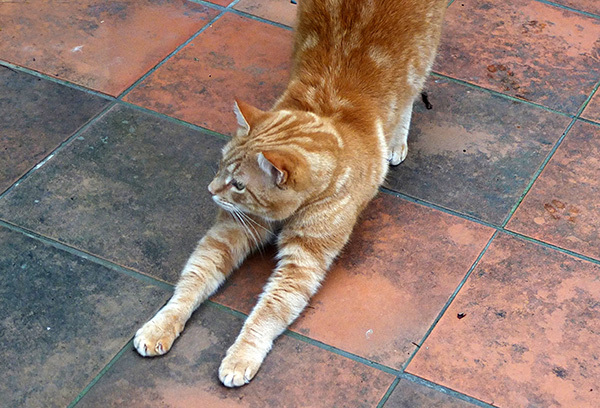 Percy the ginger cat is more modest, and prefers to gently stretch out his front paws. Don't look too closely, though. This photograph was taken in winter, and the patio pavers desperately need cleaning. 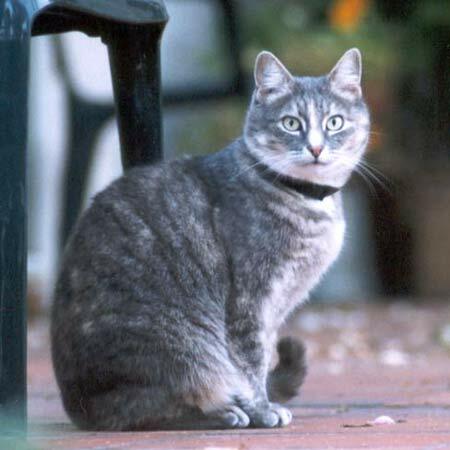 The photograph below is of dearly departed grey cat, Jerome. Deep in cat-thoughts, she sits on the front patio. The heavy plastic garden chair provides security in case of over-boisterous dog arrivals. I bought these chairs really cheaply and they have been most comfortable and sensible. Jerome had the prettiest pointed face, and was always full of love. She was always a little shy of visitors, though. 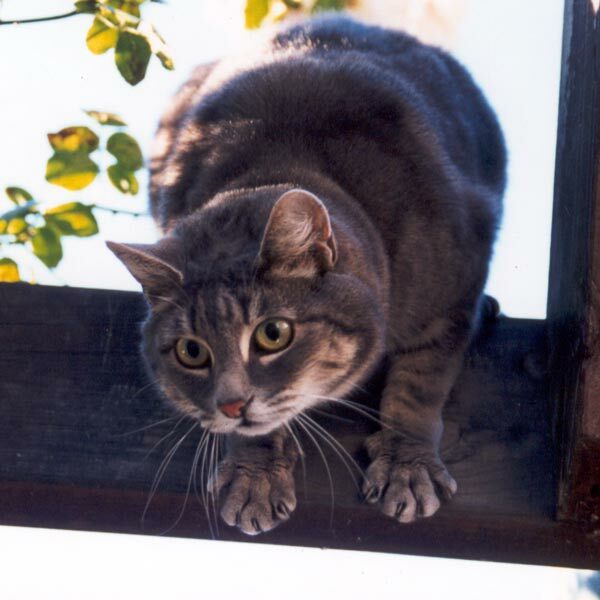 In this archive photograph Stumpy cat (Jerome's sister) has just climbed up the pergola on the house patio, and looks like she is trying to get back down. The speed she would climb through the New Dawn rose wrapped around the post was amazing. I never could understand why she didn't get snagged on the thorns. And I'd worry that she'd jump straight down onto the unforgiving tiled concrete. Ouch! Stumpy and Jerome were two of my original Moosey cats. They now each have a memorial tree (a weeping Silver Pear) in the Hazelnut Orchard.